Holy Names University spends the morning tagging! Home/Events, Graffiti Art, Mural Production, Team Building Workshops, Uncategorized/Holy Names University spends the morning tagging! High school students from Holy Names University‘s summer program stopped by 1AM bright and early to practice sketching out their new graffiti writer names and paint a mural with our teacher. 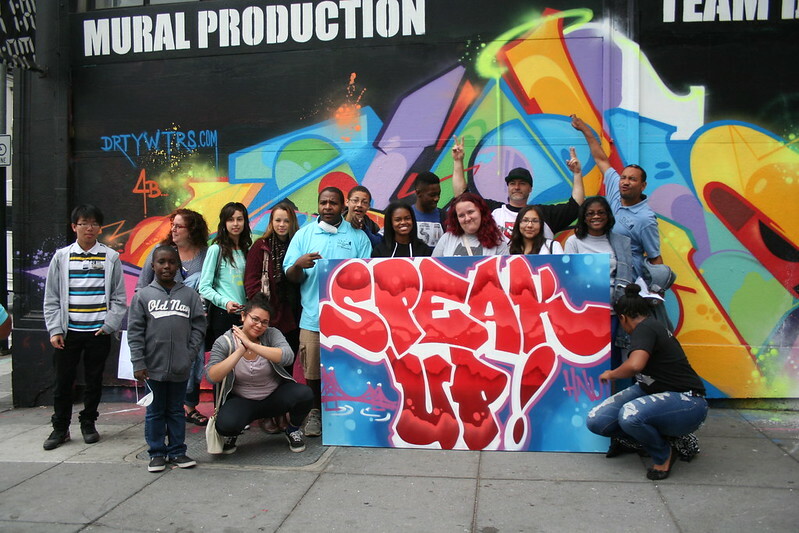 Opting to produce their mural on canvas so that they could bring it home with them, the group ultimately chose to inscribe the uplifting message of “Speak up!” across their canvas and it ended up looking aesthetically inspiring as well! Send the gallery an email at privateevents@1amsf.com to start the conversation about your next team-building event!